Talk about popular Android phones! The Samsung Galaxy S seems to be becoming quite famous with Samsung reportedly shipping about 1 Million Galaxy S smartphones into the US. Since its launch on August 15th, Galaxy S has seen some strong sales and has been pushing itself up on the charts as one of the best selling Android smartphones and it all started on August 15th when the phone went on sale. A quick rundown, Galaxy S comes to you with 512 MB of memory and a 4-inch Super AMOLED screen and runs on a powerful 1 GHZ processor. It also has a five mega-pixel camera, GPS, Bluetooth 3.0, USB 2.0 and WiFi. It also has a micro SD card slot which can increase your storage to up to 32 GB. Samsung Galaxy S is available in the US with AT&T and T-Mobile and will be available for Verizon customers starting August 31. 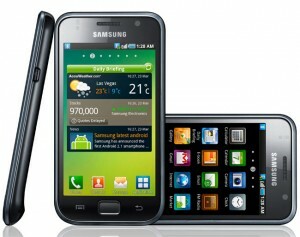 Samsung Galaxy W Sports 1.4GHz Power! Previous 575 Percent Rise in Women Using Mobile Web! Next Next-Gen iPod Nano – Smaller with Touch Screen!